Chatroulette is exactly what you see in the picture – two small screens (for the two web cams), some instructions, a link at the bottom of the page. No need to register, you are an unknown person (apart of the cam). The best description I found: a social media toy. Maybe this is exactly what attracts so many users and so many new ones every day. I know it’s not new. But believe it or not, I heard about it only a couple of days ago. How come? I read the online news regularly, well I missed it. And still, the turning point is ahead of us. As it was at the beginning of Facebook before we even thought about what it could become. I haven’t tested it yet, I’ve only heard and read a lot about all the naked, clothed, disguised people you can see. This I can imagine. 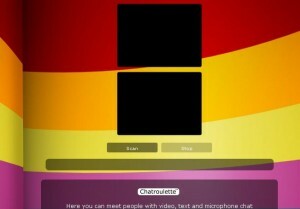 But what I am more curious about is what Chatroulette could develop into. Some predict it turning into another pornographic site, others see it changing and becoming a new online category. In fact, Chatroulette’s founder Andrey Ternovskiy was just bored talking over Skype to people you know and created this new trend – a Skype for strangers… Just at the right time, it seems.